Toddler Busy Activity: "Playing the Slots"
This is by far my favorite keep-the-toddler busy activity of all time. It never failed to entertain my kids when they were little! 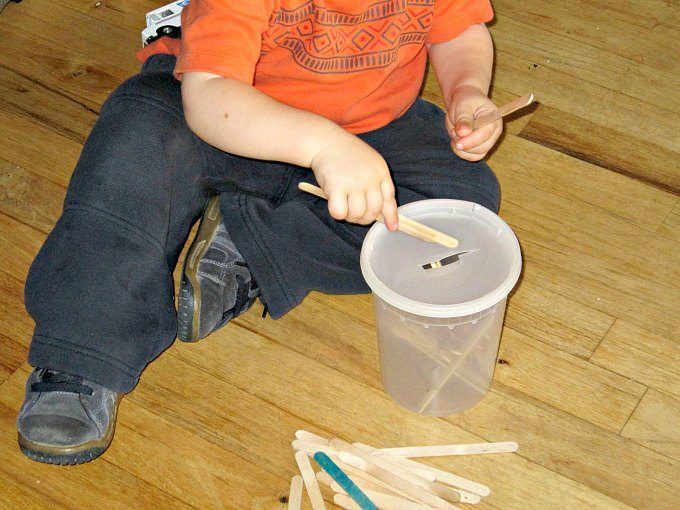 Don’t tell my kids I told you, but they still get drawn into pushing the wooden craft sticks into the little slot in the lid of the container! I always have one on hand in case a toddler or preschooler drops by – instant entertainment so the parents can enjoy a nice cup of tea and a good chat. Plus, it exercises those all important fine motor skills. Win-win-win-win! Gather your supplies. 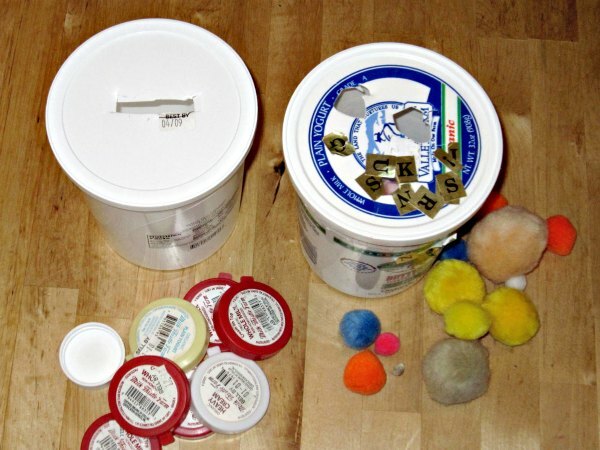 You will need a clean plastic container with a lid. A large yogurt container is perfect. Also get a sharp scissors (keep away from the toddler!) and a handful of wooden craft sticks. Poke a straight hole in the top of the lid. Place the lid on tight and show your toddler how to push the sticks through the holes. Of course, you can decorate your toddler’s fine motor activity jar if you like, but why bother? He’ll still love it. Alternatively, you can offer pom poms instead of craft sticks. No matter what objects you use ALWAYS SUPERVISE YOUR CHILD. And do not use any object that might be a chocking hazard. I’m willing to bet this toddler and preschooler fine motor activity jar, what I like to call “playing the slots”, will become a classic toy in your home, too! Free play with all those craft sticks! See all our indoor activity ideas for kids! The old favorites are old favorites for a reason!!! I just got the book! Thank you so much. My husband ran the NYC marathon this weekend and I thought of you.